Han® connectors provide for a reliable and pluggable transmission of power, signal and data, meeting the highest requirements. In addition to its rectangular heavy-duty standard design, the Han® series offers modular, compact and lightweight connectors that deliver a wide range of solutions for the machinery, transportation, energy, automotive and device connectivity sectors. The Han-Smart generation brings the intelligence into the connector. Various hoods / housings, inserts, contacts, termination techniques and locking mechanisms can be adapted according to your application requirements. 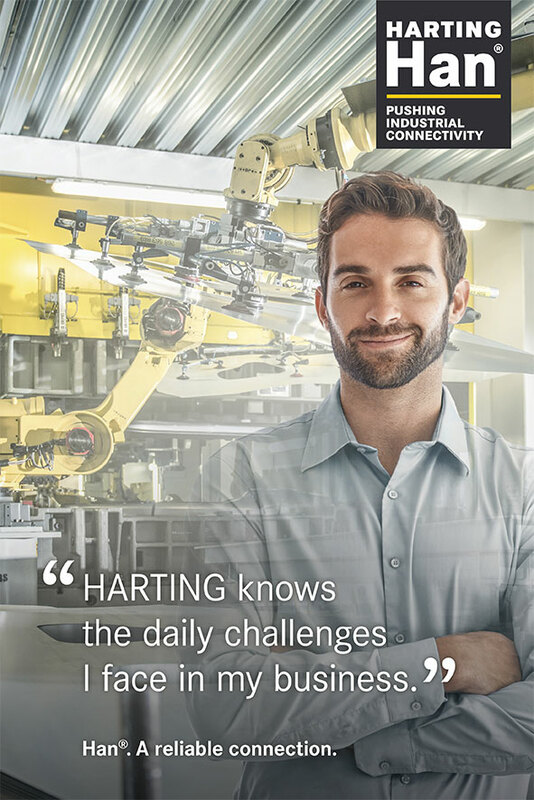 The rectangle connectors made by HARTING are versatile and yet easy to handle. Thus, the completely pre-assembled high quality power chain systems made by igus® – supplied by HARTING industrial connectors – are more quickly delivered to our customers worldwide. The modular connector series: integrating power, signal, data and even compressed air into a single unique interface. The insert offers now a tool-less rapid termination technology. In addition, users can quickly and easily bridge contacts by placing plug-in jumpers directly at the connector. The compact connector: combined with its elegant design, Han-Yellock® offers a wide range of contact options as well as ease of use.